This is an affordable, no-nonsense option for parents on a tight budget. Some product quality issues bogged down our rating; but overall you get what you pay for, and more! What’s in a Milliard Crib and Toddler Bed Mattress? What Can Be Used with the Milliard Crib and Toddler Bed Mattress? What’s the Weight Capacity of the Milliard Crib and Toddler Bed Mattress? Does Milliard Bedding Offer a Sleep Trial, Return Policy and Warranty? How Much Does the Milliard Crib and Toddler Bed Mattress Cost? Milliard Bedding has been coming out with mattresses and other bedroom products since 2009. Unlike many of competitors, though, Milliard crib mattresses are not made in the USA. Most of this Jersey Shore-based company’s products are made in China, Japan or India. We should point out, though, that this should not necessarily affect product quality expectations. This particular product we’re reviewing comes up in crib mattress top lists very often. Why? What’s usually cited as the main selling point of the Milliard Crib and Toddler Bed Mattress is its affordable price point. How does it perform, though? That’s what we set out to learn here. Read on to find out all about the Milliard Crib and Toddler Bed Mattress. Milliard Bedding uses CertiPUR-US certified foams only, which is as good as an industry standard by now. However, there’s a distinct lack of a clearly stated GREENGUARD Gold certification! This is the first crib mattress we’ve reviewed without one. The Milliard Crib and Toddler Bed Mattress has one of the most uncomplicated interiors we’ve seen: a 5.5-inch thick solid block of Milliard foam. This material is then encased in a fiberglass-lined fire sock, before it’s encased in a removable mattress cover. The non-removable fire retardant measure doesn’t use any harmful chemicals, and it’s also one of the most effective. It’s compliant with all federal flammability safety regulations, too. Note, though, that fiberglass-based flame barriers may also suffer from poor durability in the long run. Upon heavy research, it seems that Milliard foam is simply high density polyurethane foam. Milliard Bedding claims that the foam they use is luxurious and of superior quality. The foam is also said to be antimicrobial and hypoallergenic; and resistant to bacteria, dust mites and mold. It’s designed for maximum heat regulation and weight distribution, too, both of which help reduce tossing and turning. What Is the Milliard Crib and Toddler Bed Mattress Cover Made From? The crib mattress cover is made from polyester and thermoplastic polyurethene (TPU) undercoating. 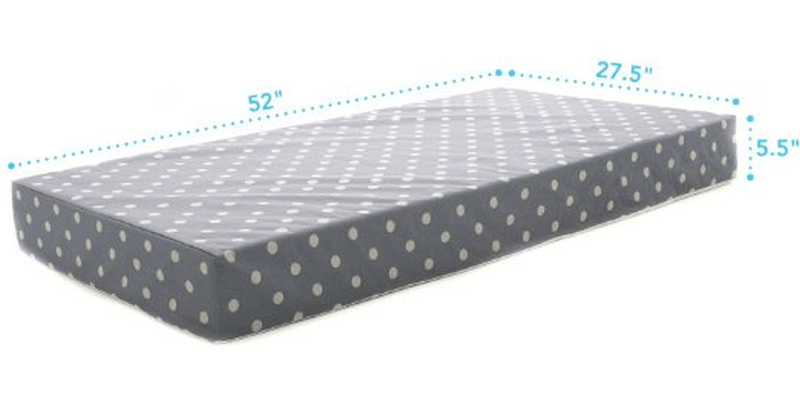 The polyester-based mattress cover also features a fun polka dotted print, and it both zip removable and waterproof. The fit is not very snug, so it is normal to notice a little rippling of fabric. TPU is an elastomer—a polymer with elastic properties—which is very flexible and adaptable, making it a popular material to use in dozens of manufacturing industries. It makes for the undercoating of a crib mattress cover to be made from thermoplastic polyurethane (TPU). After all, it is what’s often used for waterproof parts of diaper covers, too. 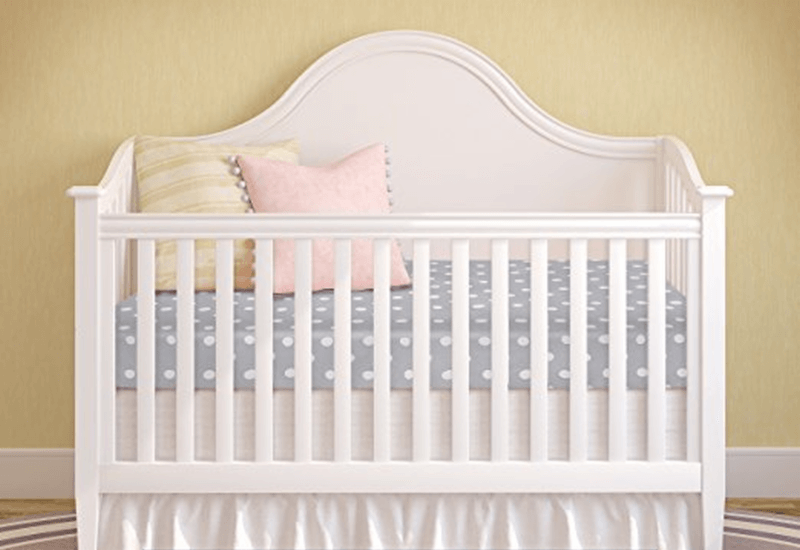 Can You Customize the Milliard Crib and Toddler Bed Mattress? Short answer: No. With the Milliard Crib and Toddler Bed Mattress, what you see is what you get! No other cover designs, no other sizes. Worth mentioning here, though, is that there’s a completely different version of this crib mattress. 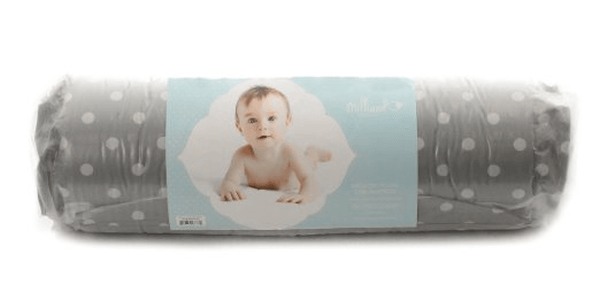 We are reviewing the Milliard Crib and Toddler Bed Mattress. There is a similar-looking Milliard Bedding product using memory foam, but it’s not marketed as an optional change. Rather, it’s a different product altogether, which has caused some confusion among customers. The difference between the two crib mattresses lies in their respective interiors. The Milliard Memory Foam Crib Mattress has two internal layers: 4 inches of Milliard foam and 1.5 inches Milliard memory foam. In comparison, the Milliard Crib and Toddler Bed Mattress we’re reviewing here has only the one homogenous block of Milliard foam. Let’s address a typical misunderstanding. Contrary to what you may glean from the name, the Milliard Crib and Toddler Bed Mattress is not dual-sided! There is no infant side or toddler side. What does the name mean, then? Milliard Bedding is asserting that it’s fit for both cribs and toddler-sized beds. Feel free to flip it as often as you want, as it will make no difference in firmness or support. If you’re looking for a two-stage crib mattress, you can check out our reviews of the Moonlight Slumber Little Dreamer or the Colgate Eco Classica III. US Consumer Product Safety Commission (CPSC) regulations regarding crib mattresses are clear. The length and width must be 27.25 inches by 51.25 inches at the very least, and the thickness 6 inches at the most. The Milliard Crib and Toddler Bed Mattress sits perfectly within these requirements: 27.5 inches wide and 52 inches long, 5.5 inches thick. This means that any standard size crib, fitted sheet or mattress protector should be compatible with it. Not sure of the size of your crib? Perform the two finger test and check for too much space between the crib and the mattress. 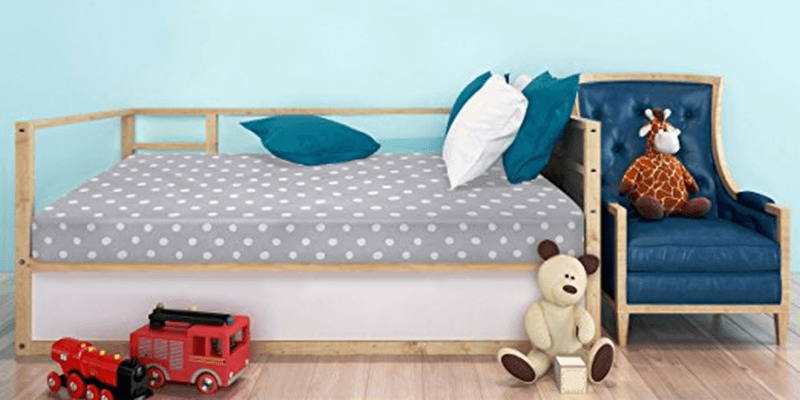 If you find that the gap is too wide, either the Milliard Crib and Toddler Bed Mattress being used is defective or the crib is not of standard size. In any case, a failed two finger test means that the two products aren’t compatible. Using both of them in tandem may pose a danger to your little one! Change one of the two to keep your child safe. Also: We recommend purchasing a waterproof mattress protector to use with the Milliard Crib and Toddler Bed mattress. Why? We’ll discuss this in the next section. How Do You Set Up the Milliard Crib and Toddler Bed Mattress? Talk about a compact product! 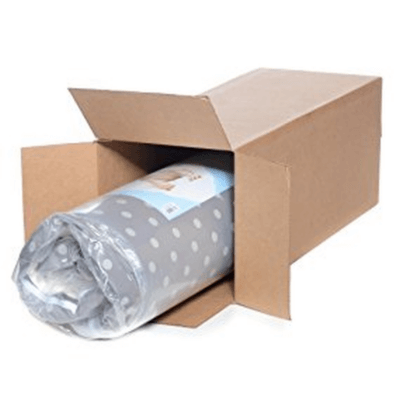 Most crib mattresses that you can order online come in frustration-free cardboard boxes. The Milliard Crib and Toddler Bed Mattress is no different, but you might the small size of the box may confuse you. This crib mattress is shipped like most regular-sized foam mattresses. It’s compressed, vacuum sealed and rolled up. To set it up, remove from packaging and lay it flat on a surface in a warm and well ventilated area for two to three days. This allows it to decompress fully and gives the new mattress smell time to dissipate. Some negative reviews note that it took weeks for the Milliard Crib and Toddler Bed Mattress to air our completely, though. If that the smell is particularly strong, try removing the cover and airing out the foam and cover as separate items. This may speed up the process, and it also allows you to inspect the mattress cover for possible defects. How Do You Clean the Milliard Crib and Toddler Bed Mattress? Setup is painless, but maintenance is another issue. Cleaning difficulties are some of the most common complaints in the customer feedback we combed through. Remember that removable mattress cover? It’s said to be washable on top of responding well to spot cleaning, but that’s not the same as machine washable. It just means that you can immerse it in water and completely soak it before hang drying. If you throw the mattress cover in a washing machine, the waterproof TPU coating may flake and make a mess of things. We’ve also seen customer complaints of flaking happening even before the first cleaning! There are accounts of the defect being discovered only upon the first time the cover is unzipped. While most of the feedback of this kind were very negative, some did contain a silver lining. Those that did contact Milliard Bedding directly about the issue received prompt responses. Cover replacements were sent, with the explanation being that the defective covers might have come from older stock. There’s no officially stated weight limit, as far as we can verify; but there’s a lot of customer feedback that may help in this case. Did you know that the Milliard Crib and Toddler Bed Mattress is also a popular per bed option? We didn’t, and this is very puzzling for us, as Milliard Bedding also sells pet beds for a comparable price. Perhaps some pet owners prefer crib mattress dimensions. What’s the point here? We’ve seen positive feedback from several customers that bought this product for their big dogs. Think Dobermans, German Shepherds, even Great Danes. These are all dog breeds that, full grown, weigh much more than an average toddler. Therefore, we can conclude that the weight capacity is sufficient for the intended use of the crib mattress. How Does the Milliard Crib and Toddler Bed Mattress Feel? The only complaint we’ve seen in this vein is the usual “might as well put a sheet over plywood” comparison. We’ll say it again and again, though: Babies should not be sleeping on a soft surface, because it can be dangerous for them to do so. Unless your child literally cannot sleep on it, there’s no reason to believe that what you feel as undue mattress firmness is detrimental. As for other related issues, we’ve seen no complaints about heat retention or scratchiness. There were complaints about slight “squeaking” and “crackling” noises, though. This could be caused by the cover’s TPU undercoating. To be honest, it doesn’t take much for the Milliard Crib and Toddler Bed Mattress to be worth its very affordable cost. What it promises in its full product name—Crib and Toddler Bed Mattress with Removable Cover—is simple. The Milliard Crib and Toddler Bed Mattress does comes in a standard size, with a zippered cover, and can support the weight of a baby or toddler. We have some qualms about its lack of certifications and the quality of its mattress cover, but the mattress seems to be sturdy. It may smell and it will off-gas, albeit with low emissions as guaranteed by CertiPUR-US compliance. There’s no way around that except to air it out, as it is a foam mattress. If you or your baby are especially sensitive or allergy-prone, you may want to take that into account. Our take: You get what you pay for, and the Milliard Crib and Toddler Bed Mattress definitely delivers. How is Milliard Bedding’s Customer Support? Customer support can be reached through several avenues. Milliard Bedding provides an email address, as well as a telephone hotline following EST business hours. There is also a contact form on the official website. Milliard Bedding also has Twitter and Instagram accounts that you can contact. According to most feedback mentioning Milliard Bedding customer support, replies are typically prompt and helpful. There is a return policy that comes with a 30-day money-back guarantee. Holding on to an unused item and want to return it for a full refund? You can within 30 days of purchase—not delivery—with no questions asked. In these cases, though, it’s expected for customers to shoulder return shipment costs. Returning an item because of manufacturing defects or damage incurred during shipping? Refunds will be issued for both full item price and return shipping costs. Just remember to keep the original packaging, as you need to return those as well in case you want to avail of the guarantee. We also recommend checking the waterproof backing of the mattress cover immediately! Keeping an eye on how it performs in the first month of use, too. It’s the weak point of the product, and the part that’s likely to need replacement. While there is a guarantee, there is no warranty—as far as we can tell. It’s not mentioned anywhere on the official website. This is disappointing, but also not unexpected considering the price point. As of this writing, the Milliard Crib and Toddler Bed Mattress is $53.99 on the company’s official website and $58.99 on Amazon. If you purchase through the official website—should their stock replenish by the time you read this—you will appreciate the free standard shipping and the fact that Milliard Bedding ships to all 50 US states. However, they don’t ship to military bases. International shipping is available on Amazon, though! Visit Amazon & Find Milliard Crib Mattress Deals Now! On a tight budget and looking for a no-nonsense, affordable starter crib mattress? The Milliard Crib and Toddler Bed Mattress could be your best bet. It’s not eco-friendly or organic or innovative; but it is exactly what you expect. Because you can always buy comfy crib sheets or waterproof mattress protectors—some as cheap as $10!—the only real concern is the quality of the foam itself. If you’re not too particular or fussy about polyurethane foam and are willing to air out the product for a few days should it have that “new mattress smell”, then we suggest you go for it! After all, you have 30 days to figure out if your little one takes a liking to it or not. While it’s not our top choice, it’s a great budget alternative.